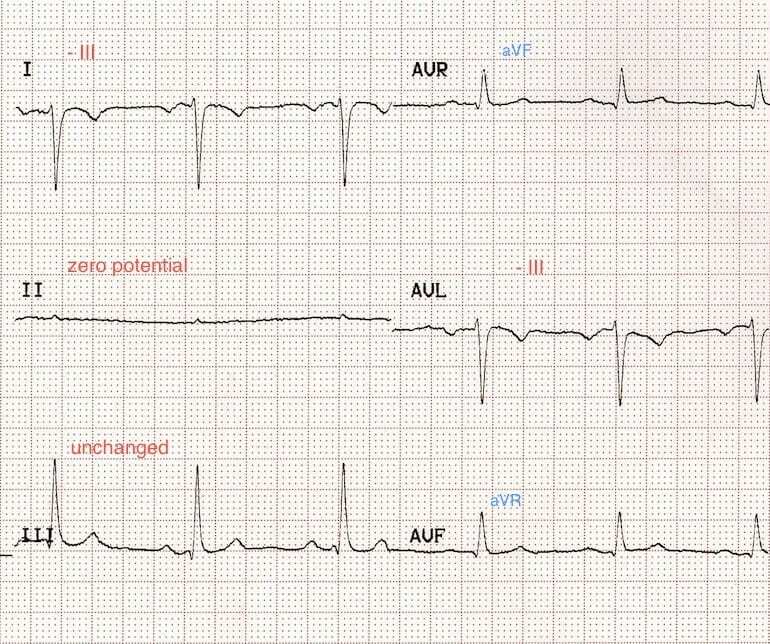 Accidental misplacement of the limb lead electrodes is a common cause of ECG abnormality and may simulate pathology such as ectopic atrial rhythm, chamber enlargement or myocardial ischaemia and infarction. 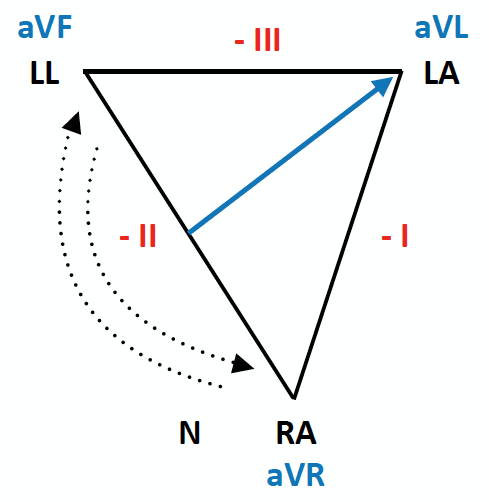 When the limb electrodes (LA, RA, LL) are exchanged without disturbing the neutral electrode (RL/N), Einthoven’s triangle is “flipped” 180 degrees or rotated, resulting in leads that switch positions, become inverted or remain unchanged (depending on their initial position and vector). Exchanging one of the limb electrodes with the neutral electrode (RL/N) disrupts Einthoven’s triangle and distorts the zero signal received from Wilson’s central terminal, altering the appearance of both limb and precordial leads. Limb leads may be grossly affected, taking on the appearance of other leads or being reduced to a flat line. Wilson’s central terminus (WCT): the ‘zero’ lead, produced by averaging signals from the limb electrodes. 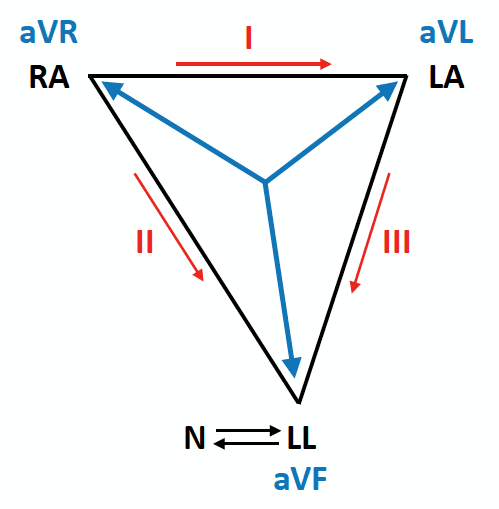 The relationship between the limb leads and electrodes is described by Einthoven triangle. Each lead has a specific quantity and direction (vector) produced by adding or subtracting voltages from the recording electrodes. Lead I is the voltage difference between the LA and RA electrodes (LA – RA), directed towards LA at zero degrees. Lead II is the voltage difference between the LL and RA electrodes (LL – RA), directed towards LL at +60 degrees. Lead III is the voltage difference between the LL and LA electrodes (LL – LA), directed towards LL at +120 degrees. Lead aVL is directed towards the LA electrode (-30 degrees), calculated as follows: aVL = LA – (RA + LL)/2. 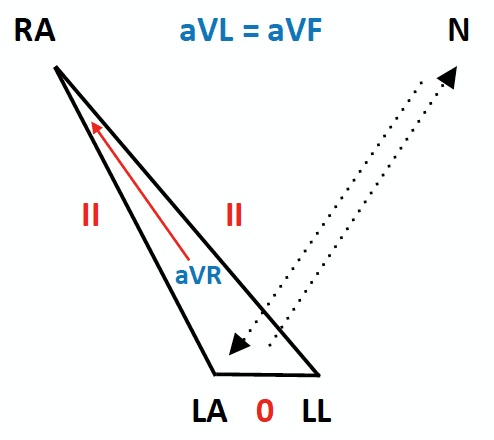 Lead aVF is directed towards the LL electrode (+90 degrees), calculated as follows: aVF = LL – (LA + RA)/2. 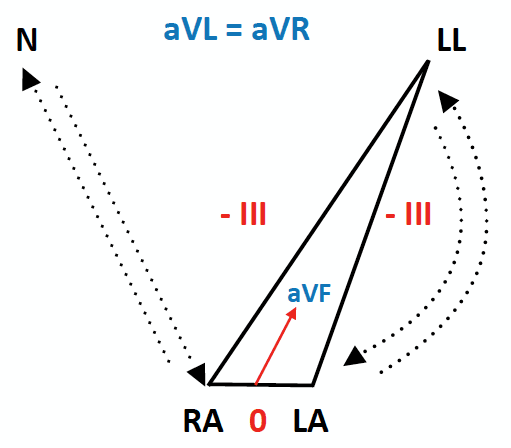 Lead aVR is directed towards the RA electrode (-150 degrees), calculated as follows: aVR = RA – (LA + LL)/2. This directionless “zero lead” lead is calculated as the average input from the three limb leads: WCT = 1/3 (RA + LA + LL). 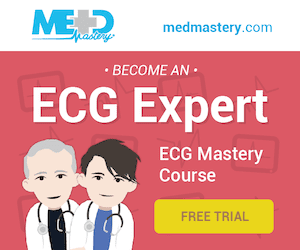 An understanding of Einthoven’s triangle and the mathematical derivations of each lead will help us in understanding the ECG patterns produced by each type of limb lead reversal. 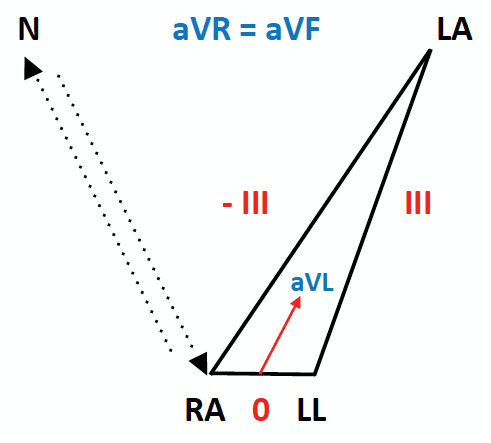 With reversal of the LA and RA electrodes, Einthoven’s triangle flips 180 degrees horizontally around an axis formed by lead aVF. Leads II and III switch places. Leads aVL and aVR switch places. 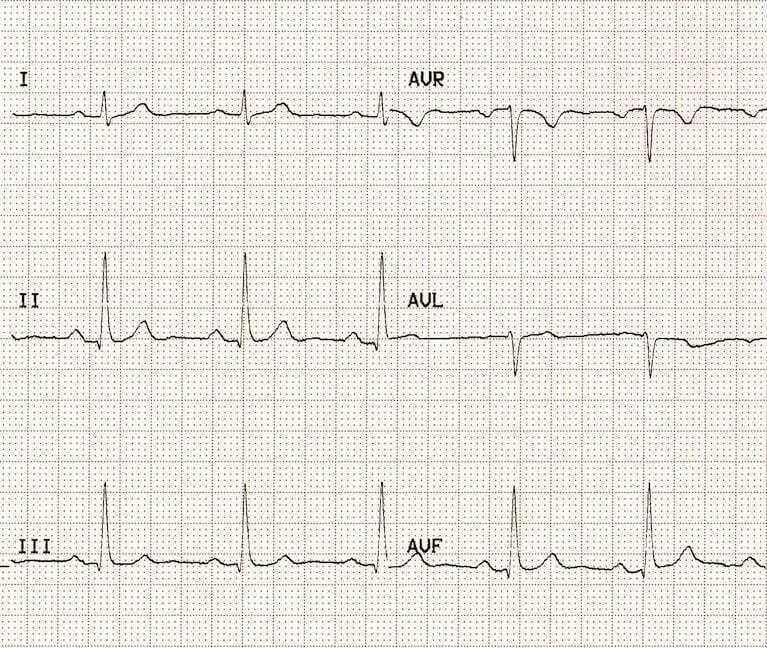 Lead I is completely inverted (P wave, QRS complex and T wave). Lead aVR often becomes positive. There may be marked right axis deviation. LA/RA reversal may simulate dextrocardia. 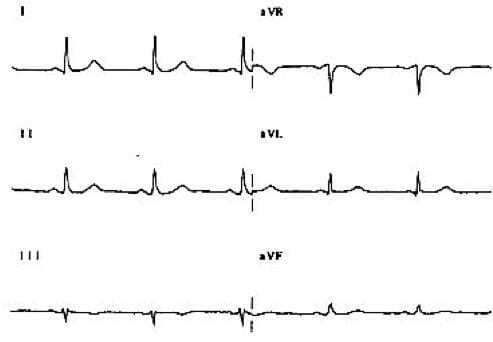 However, in contrast to dextrocardia there is normal R wave progression in the precordial leads. 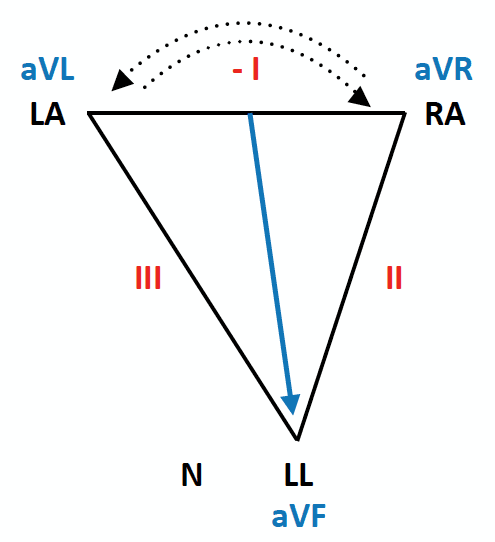 With reversal of the LA and LL electrodes, Einthoven’s triangle rotates 180 degrees vertically around an axis formed by aVR. Leads I and II switch places. Leads aVL and aVF switch places. 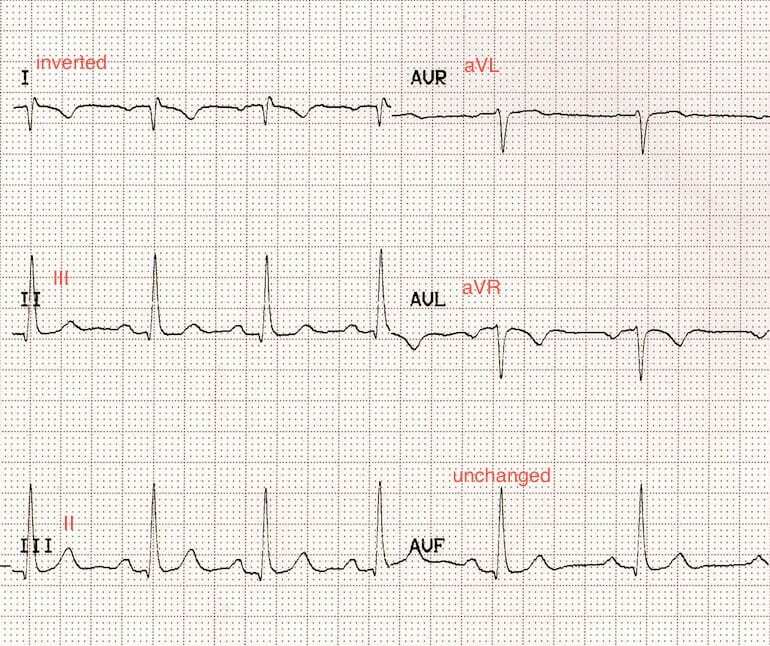 The P-wave is unexpectedly larger in lead I than lead II (it is usually the other way around). 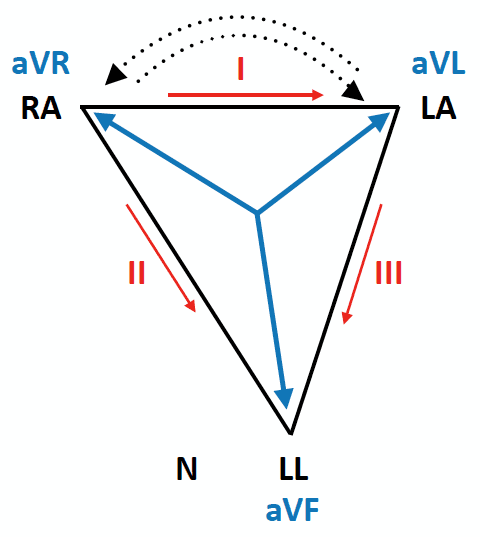 With reversal of the RA and LL electrodes, Einthoven’s triangle rotates 180 degrees vertically around an axis formed by aVL. Leads I and III become inverted and switch places. Leads aVR and aVF switch places. 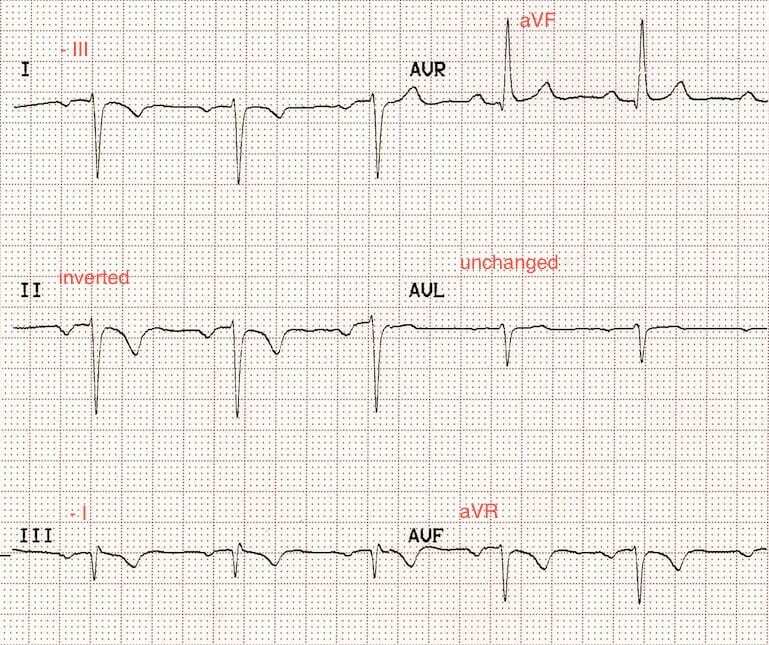 Leads I, II, III and aVF are all completely inverted (P wave, QRS complex and T wave). With reversal of the RA and RL(N) electrodes, Einthoven’s triangle collapses to very thin “slice” with the LA electrode at its apex. The RA and LL electrodes now record almost identical voltages, making the difference between them negligible (i.e, lead II = zero). Lead aVL runs within this thin slice, facing approximately opposite to lead III. 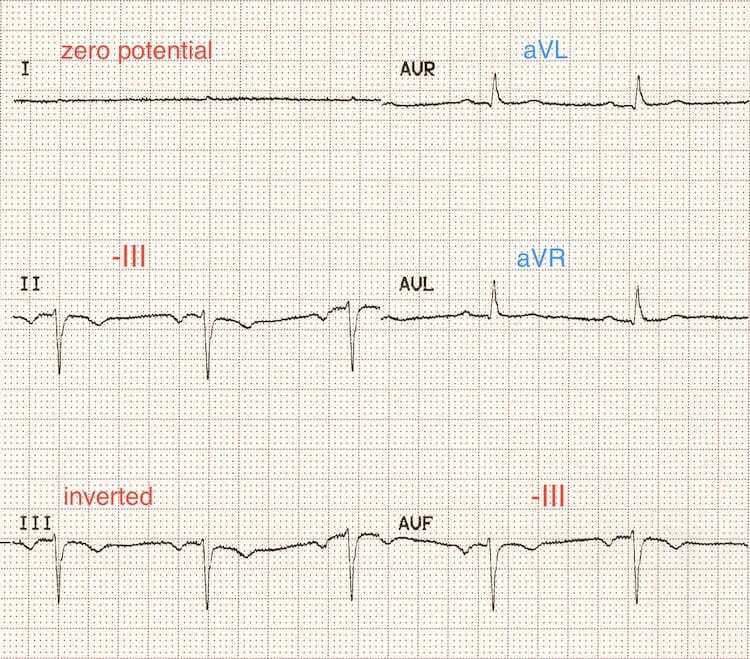 Displacement of the neutral electrode renders leads aVR and aVF mathematically identical, such that they appear exactly alike (but different to the baseline ECG). Lead I becomes an inverted lead III. Lead II records a flat line (zero potential). Lead aVL approximates an inverted lead III. Leads aVR and aVF become identical. 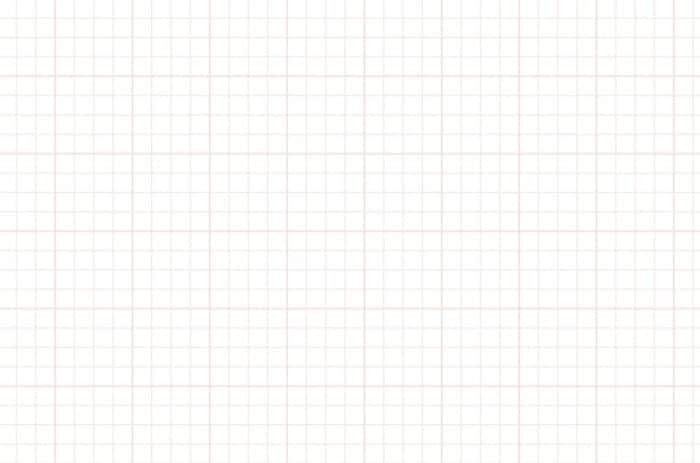 As the neutral electrode has been moved, the precordial voltages may also be distorted. Lead II is a flat line. With reversal of the LA and RL(N) electrodes, Einthoven’s triangle collapses to very thin “slice” with the RA electrode at its apex. The LA and LL electrodes now record almost identical voltages, making the difference between them negligible (i.e. lead III = zero). Lead aVR runs within this thin slice, facing approximately opposite to lead II. 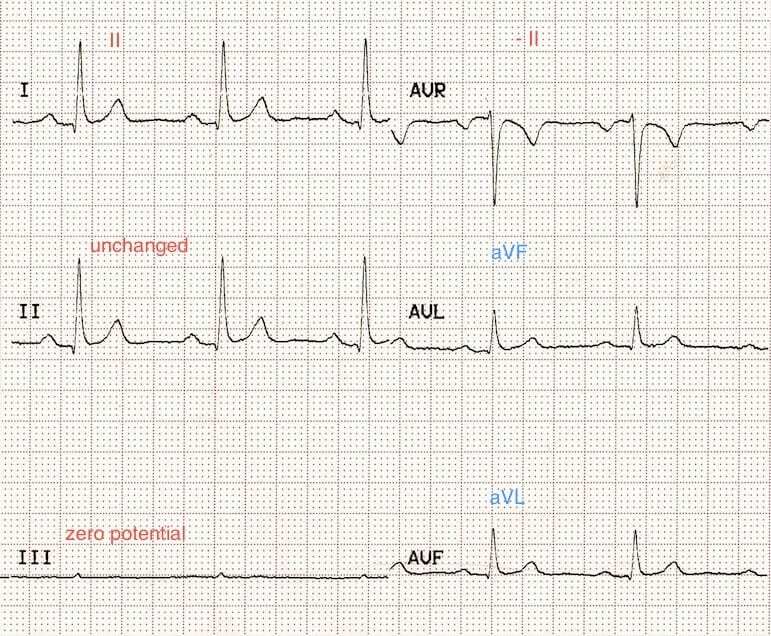 The displacement of the neutral electrode renders leads aVL and aVF mathematically identical, such that they appear exactly alike (but different to the baseline ECG). Lead I becomes identical to lead II. Lead III records a flat line (zero potential). Lead aVR approximates to an inverted lead II. Leads aVL and aVF become identical. Lead III is a flat line. 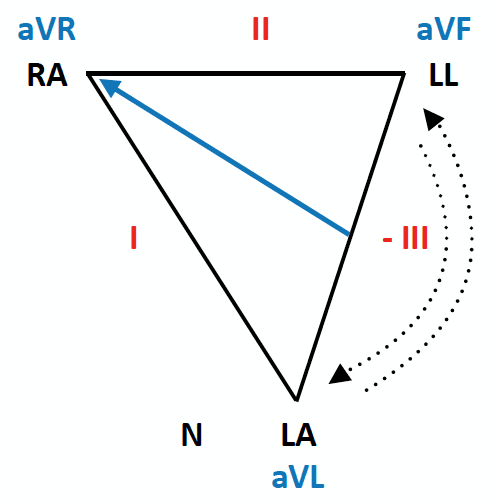 If the electrodes on each arm are swopped with their corresponding leg electrode (LA with LL, RA with RL), Einthoven’s triangle collapses to a very thin slice with the LL electrode at its apex. The RA and LA electrodes (now sitting on adjacent feet) record almost identical voltages, which makes the difference between them negligible (i.e. lead I = zero). 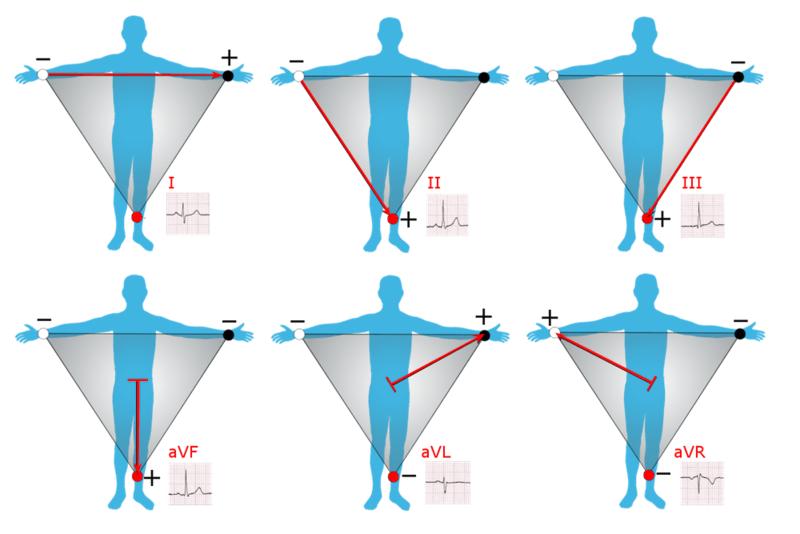 Leads II, III and aVF all become identical (equivalent to inverted lead III), as they are all now measuring the voltage difference between the left arm and the legs. 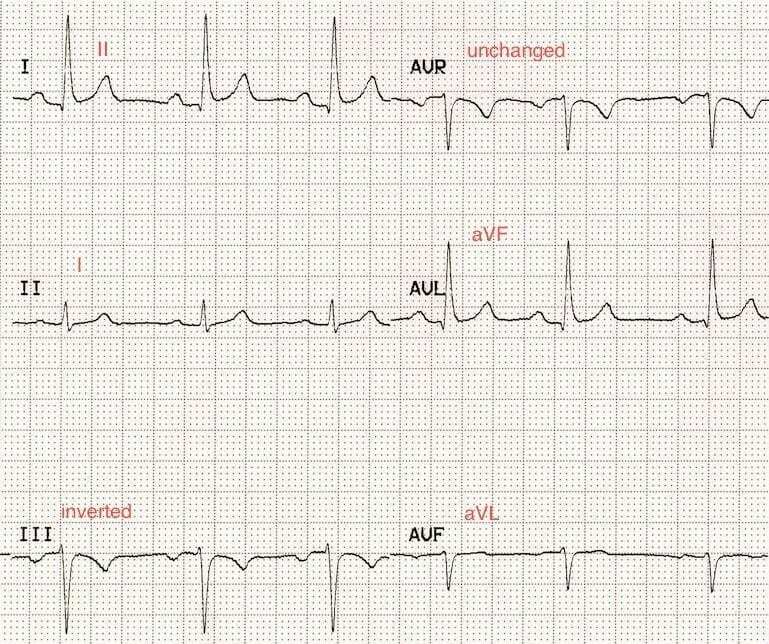 The displacement of the neutral electrode renders leads aVL and aVR mathematically identical, such that they appear exactly alike (but different to the baseline ECG). Lead I records a flat line (zero potential). Lead II approximates an inverted lead III. aVR and aVL become identical. aVF looks like negative lead III. Lead I is a flat line. With reversal of the lower limb electrodes, Einthoven’s triangle is preserved as the electrical signals from each leg are virtually identical. The ECG is therefore unchanged. 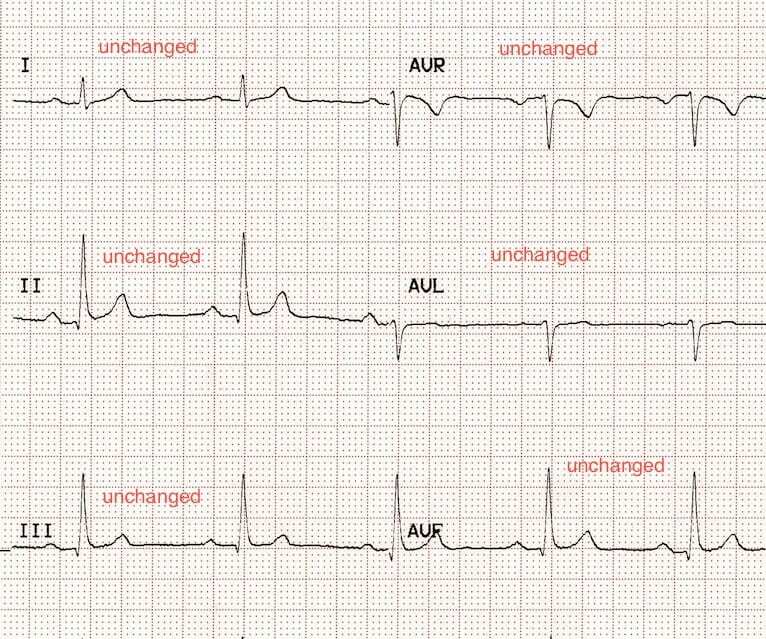 But don’t worry, it won’t make any difference to your ECG interpretation.